Sometimes a film comes along and it's something you deeply look forward to seeing. It’s a movie that you wait months to see. This is one that on paper should work and it has everything going for it. An interesting Charlie Kaufman like premise that could offer audiences a new perspective on how we look at the world? Check. A great director who has made some of the most interesting character pieces of the last two decades? Check. A cast and crew filled with talented people who have shown time and time again that they are able to make great work? Check. And yet with everything going for it, Downsizing is a disappointing and frustrating reminder of what can when an auteur misfires. Downsizing is the new high concept science fiction comedy satire from acclaimed director Alexander Payne. It's the story of how a world reacts to a new and amazing procedure designed to help humanity and the rapidly changing world around us. Scientists in Norway come up with the technology to reduce humans safely in size so that they can generate less waste, use fewer resources, and take up less space. Considering that we are living on an overpopulated planet that’s becoming overrun with waste, becoming more and more expensive, and gradually less inhabitable, these scientists believe that downsizing could be the very thing that saves us all. Paul (Matt Damon) decides to abandon his stressed middle class life in order to get small and move to a new downsized community where he will live new and fulfilling lives as essentially tiny millionaires. Paul soon discovers after striking a relationship with Ngoc Lan Tran (Hong Chau), a disabled Vietnamese refugee, that even in the new downsized communities the world is still unbalanced. For it’s first forty-five minutes or so, Downsizing is a hilarious and surreal satire about modern life. This plays to Payne and writing partner Jim Taylor’s strengths as storytellers, the way the two write character interactions and focus in on the external lives of these characters as a way of understanding who they are. Matt Damon and Kristen Wiig do a great job of playing stressed out middle class working stiffs trapped in a dead end world. We believe in these characters and the world they live in. 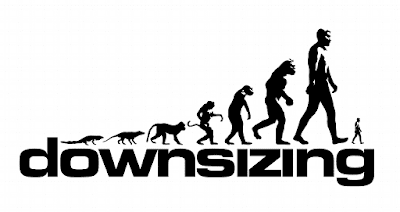 We understand why they would want to do something like Downsizing. The funny realism of the world these characters inhabit and the longing for something better is something that these two could do in their sleep. The world feels different but not too far from what we know. The visuals are dazzling and it promises a story about looking at the world in a new perspective. And then it doesn’t. 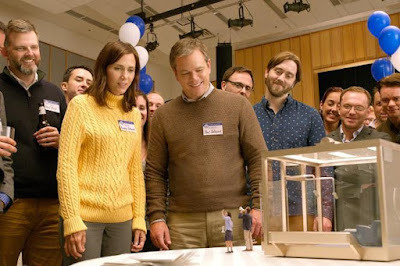 The second half of the film essentially moves away from the social satire of the downsizing phenomena and tries to address classism, racism, and environmental changes with the subtle and grace of a hammer to the face. The entirety of the plot line and the character of Ngoc Lan Tran is one that imagine some will have difficulty with. Hong Chau does an admirable job inhabiting the character but her accent and story line in this film rides dangerously close to the line of being a total caricature. We don’t know her as well as we do Paul and it is detriment to both her and the whole film itself. The emotional character moments between Paul and Ngoc Lan Tran are not fleshed out and feel unearned because the film jumps around in an episodic nature. Finding out that this movie was originally supposed to be a television series makes a lot more sense and puts the movie into a new context. It feels scatterbrained and under plotted, as if Payne and Taylor wanted to say more but simply couldn’t find a way for the story to end up in a way that fit coherently with what they wanted to say. The result is a movie that feels like three seasons of television mashed up in to one two hour plus movie. Perhaps if the filmmakers had focused on the social satire or the dynamics between Paul and Ngoc Lan Tran, this film would have been so much farther. It is ironic that a film that is focused about shrinking has too many big picture ideas in it.